Dad Follows The Moon To Find Military Son's Resting Place Robert Stokely couldn't sleep while his son was in Iraq with the National Guard. In 2005, Michael Stokely was killed by a roadside bomb. 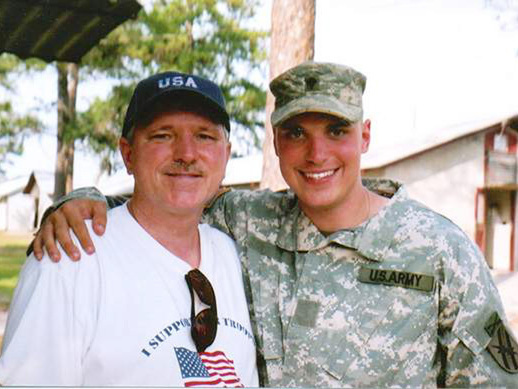 A few years later, Robert headed to Iraq himself, to find the spot where his son had died. Robert Stokely and his son, Michael, who died on deployment in Iraq in 2005. "While he was in Iraq, at night I couldn't sleep," Robert Stokely says of his son, Michael. Sgt. Michael Stokely served in the Georgia Army National Guard. He was deployed to Iraq in 2005. "I used to look at the moon a lot," Robert says, "and I told Mike, 'When you see the moon, know that eight hours later I'll see it too, and I'll think about you.' "
On Aug. 8, 2005, Michael called his father, and Robert asked if he would still be coming home in two weeks. "I can't take this anymore," he said. "[Michael] said, 'I love you, and I'll see you soon.' And those were the last words I heard from him," Robert says. Michael Stokely, 23, was killed by an improvised explosive device eight days after their conversation. He died on the side of the road. "I felt guilty I wasn't there to hold him when he died and comfort him. I felt guilty I wasn't able to protect him," Robert says. "So, I just had to go there and see what this place looked like. I just wanted to see where my son died. And I couldn't live if I didn't go." In November 2011, Robert flew to Iraq with a security team, staying in a safe house in Baghdad. "I sat on the roof for hours, and I just looked at the moon overhead. And I thought, I am 16 miles away. I am so close," he says. Robert wanted to put an engraved piece of marble at the site of his son's death. The next morning, the group passed through four checkpoints — but couldn't clear the fifth. "It was just so dangerous they wouldn't let us through, and they turned us back. So we were unable to get there," he says. "I wanted to kneel where Mike fell and touch that spot. I didn't get to do that. "Maybe God had a reason why I didn't go that last mile and a half, but I did get to ride some of the same roads Mike rode. So rather than feeling sorry that I didn't get there, I'm going to be happy that I got that close. I got close enough."